America's shale oil boom has been the darling of investment circles in recent years. People were throwing cash at these companies, hoping to get a piece of the rapid growth. The dramatic plunge in oil prices has made some shale projects unprofitable. Investors are waking up to the realization that not all shale oil is created equally. Drilling for oil is extremely capital intensive. Companies often borrow money to fund the exploration and drilling. Now that oil is sitting at just $55, it's likely to get much more difficult for shale players to get the financing they need after years of low interest and bond rates. Investors are betting that at least some of these more speculative shale companies won't survive if oil prices stay low for a prolonged period. Don't take our word for it. 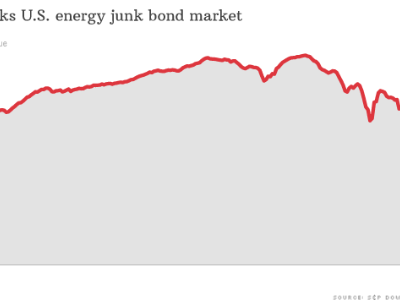 Just look at the junk bond market, which has been rattled by the energy turmoil. High-yield energy bonds have tumbled almost 10% this month alone, according to S&P Dow Jones Indices. "It becomes a vicious spiral. If bonds stay where they are, it's going to be very difficult for these companies to raise new capital to continue to live," said Spencer Cutter, a credit analyst at Bloomberg Intelligence. High-yield U.S. corporate energy bonds have tumbled in recent weeks amid the oil price meltdown. 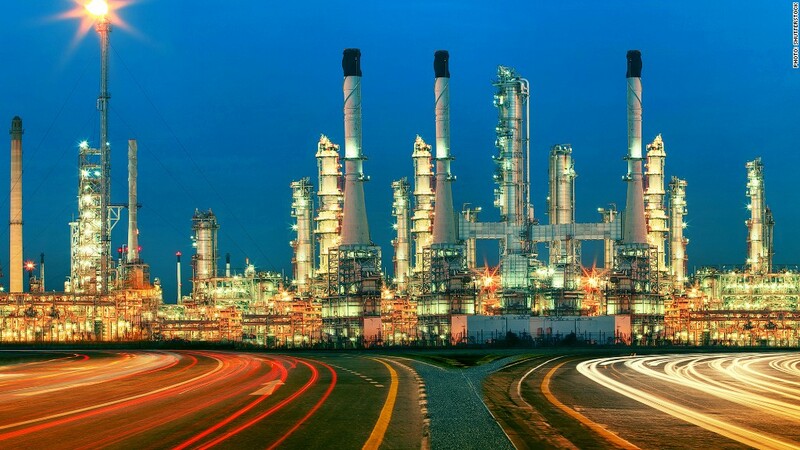 Cash flow negative: Huge energy companies like ExxonMobil (XOM) and Chevron (CVX) have plenty of financial flexibility to weather low oil prices, but that's not the case for many smaller, highly-leveraged players. Some of them are cash flow negative, meaning they aren't generating enough revenue to offset the heavy investments they are making. Up until now, they've plugged those holes by selling stock or raising equity. But $55 oil has changed that equation. Few investors are willing to provide affordable financing. For example, the bonds of SandRidge Energy (SD), Midstates Petroleum (MPO) and Resolute Energy (REN) are trading at distressed levels of just 50 cents or 60 cents on the dollar, according to FactSet. "It's hard to go from cash flow negative to cash flow positive on the turn of a dime when the commodity you're selling falls by 45%," said Cutter. Defaults ahead: The cash crunch is likely to be exacerbated by pressure from the banks, which may start reeling in credit revolvers currently cushioning shale companies' balance sheets. "Banks are not notoriously friendly in these down cycles. The lack of financing alternatives could speed up the demise" of some companies, said Tim Gramatovich, chief investment officer and co-founder of Peritus Asset Management. Gramatovich predicted a "considerable" amount of defaults among high-yield energy bonds due to the looming cash crunch. Fasten your seat belts: While most Americans aren't active investors in high-yield energy stocks, many do have exposure through mutual funds. Cash has poured into energy bonds in recent years as investors searched for yield in today's low-rate environment. Energy bonds have swelled to 15% of the U.S. high-yield market, according to S&P. Retail investors "are involved as energy investors whether they want to or not because that's where the yield has been the past few years," said Gramatovich. Another financial crisis? They could also be hurt by increased turbulence caused by the energy turmoil. There tends to be a domino effect in these situations where portfolio managers sell off unrelated assets to meet investor redemptions and margin calls. "Another unsettled and unsettling issue is whether the plunge in oil prices might trigger a new financial crisis as investors bail out of the junk bond market, which is very illiquid," Ed Yardeni, president of investment advisory Yardeni Associated, wrote in a note to clients on Tuesday. Despite the liquidity concerns about the bond market, Cutter believes the systemic risk directly tied to U.S. energy bonds "would be minimal and short lived." The real risk to the broader markets, he said, is the threat of a default by a major oil exporter like Russia.